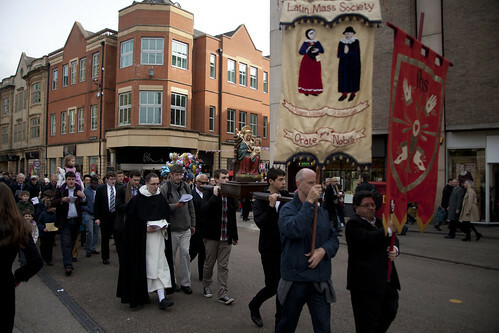 This Saturday, 19th October, is the Latin Mass Society's Oxford Pilgrimage in honour of Oxford's Catholic Martyrs. 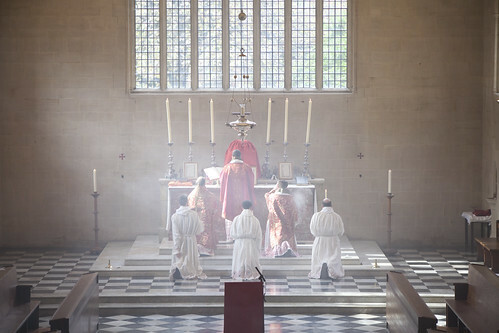 Mass is at 11am in Blackfriars, Oxford (in St Giles: map). This will be a Solemn Mass in the Dominican Rite, accompanied by Chant provided by the Schola Abelis, and Polyphony from the Newman Consort. It happens to be the Feast of St Frideswide, Patron of Oxford, and the Mass will be hers. Procession at 2pm, starting from outside St Michael's at the North Gate, Cornmarket (map). This will go down Broad Street and Holywell Street to 'Hangman's Corner', the end of Holywell Street where the Town Gallows once stood. This is where four beatified martyrs died in 1589: the priests George Nichols and Richard Yaxley, and the laymen Thomas Belson and Humphrey Prichard. Everyone is welcome to any part of the proceedings. 2-hour Pay-and-Display parking is available outside Blackfriars; longer parking can be found in a number of central Oxford car parks, the nearest being Gloucester Green and Worcester Street. Photos from last year, when we visited the other site of martyrdom, the Castle Gallows where Bl George Napier died in 1610. We alternate between these two sites, both of which are marked by plaques blessed by bishops.